The Strong, Empowered, & Classy Project highlights the people that know how to surpass boundaries and live happily despite life’s major woes. In this episode, Kristen Hayman (@MsJaneThang) sits down with Tovi Khali, (@ToviKhali), an American singer, songwriter, and poet from New Orleans, Louisiana, currently living in Chicago, Illinois; as she shares how Strength, Empowerment and Class has taken a role within her journey through life. In this two part episode, Tovi brings us a Taste of New Orleans before Katrina hit and her personal experience of the devastating hurricane that burst through the French Quarters. She also shares what life is like now and how her gifts are making room for her as she shows us how powerful real art truly is. Thank you for visiting www.janethangproductions.com. Be on the look out for more sources of inspiration from the Strong, Empowered, & Classy Project each week! 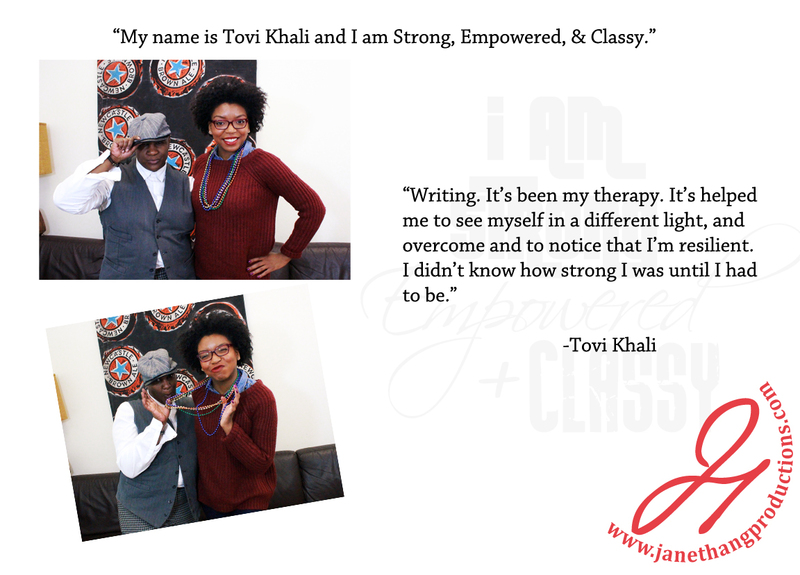 We are truly thankful for Tovi Khali’s participation in sharing her powerful perspective with us. Be sure to stay connected with her on the social media links listed above and if your are in the Chicago area, I hope to see you at her event, French Quarter Style: A musical celebration dedicated to the resilience and preservation of Ole’ Orleans, that will be held on February 9th at The Promontory. Doors open at 6:30pm, show starts promptly at 7:00pm.